During the course we incorporate a series of interactive exercises called ‘design games’ to review and reinforce the material that is being learned. These consist of various mock landscapes on paper, the board, or scaled down 3D landscapes, which offer the students the opportunity to design in diverse environments. 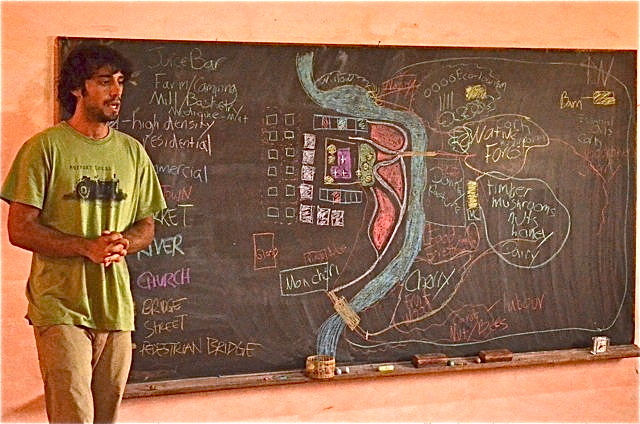 Students learn different elements found on a permaculture property and how and why they interrelate in reflection of the permaculture principles. We utilize our own set of design element card pack making the PDC even more unique in that way. Furthermore, whether it’s a chemical plant upstream or marauding pirates on an island, design games also bring in a bit of fun in the way of challenges to lighten up the atmosphere of the class. The mock designs are worked on in groups to simulate the final design project thus making that process easier through this experiential learning beforehand. They are reviewed by the entire class, with an emphasis on making connections between elements on the site so as to allow students to see how theory is applied as a designer. We also do theatre classes to help people with kinesthetic learning beyond just hands-on. Furthermore we break into small groups often to also do group discussions. This allows everyones voice to be heard and are often spontaneous when the energy inside the classroom needs shifted. However some are pre planned and incorporate the whole group like our sharing on patterns in nature which is an explorative and reflective activity after the slideshow. It helps us to pause which most of these exercises to do that way we have the time and space to integrate the lessons. All of this is to bring a diversity of teaching modalities into the learning atmosphere and increase group dynamics. In other words, we apply the permaculture principles to the course itself with for the important function of learning we use multiple elements. Furthermore we use these exercises to connect topics together like trees and economy. Thus with the help of fellow PC teacher Brian Robbins, we created an exercise that reinforces the idea of meeting a site’s need based on a tree based society. 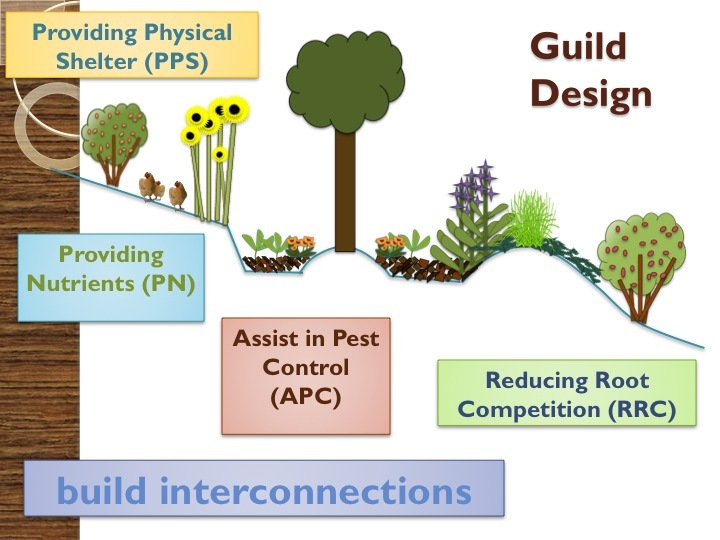 We do this with a village scale group collaborative design, that begins with groups of two developing an entrepreneurial vision for how they would capitalize on their tree assets. Students share amongst themselves to see, if their inputs and outputs of their business could match up, and too see how they could cooperate not compete. Also the project brings in the design issue of village scale design, which again makes the exercise mimic the design principle of multiple functions. Also we use these exercise as well as morning energizes to build community and resolve the need of community interaction. So sometimes we act like Protozoa and chase bacteria around to physically embody the idea of the soil food web, or sometimes we untie a human chain that made a know to simulate the unfolding of the design process. Again we can tie subjects together as we do in starting the course with demonstrating the brilliance of nature in its web pattern and how we can bring resilience back into our local communities and economies. Great little article providing lot’s of ideas and inspiration thank you!